We’re finally previewing the Pac-12. This week, the last before games actually tip, I’ll post two previews of travel mates (i.e. UW and WSU will appear in the same post) and, in the interest of being fully prepared for Friday’s hoop joy, I’ll post two-a-day. Thus the title. Although it’s 4 previews-a-day. Regardless. Enjoy. The Ringer debuted its college basketball coverage with a thorough breakdown of Lorenzo Romar’s employment. That surprised me and if it didn’t surprise you then I imagine you follow Chris Hansen’s every funding move. Alas, the Huskies bring a team to the Dawg Pound that probably isn’t going to look a lot different than last year’s. They just played an 80+ possession game and yielded 103 points to a D2 school. Two of those D2 players achieved greater than 20 points and to this I shout out to Derrick White. Husky hoops is pace. I’m ecstatic to be headed to HecEd for my first Washington-Arizona game. Allow me a litany of reasons: Some of my favorites are Seattlites; this is my favorite Macklemore song; I once brought a Husky (best friend) to the second row of the McKale Center (Cats by 17 if you were curious); I like coffee; the Kid’s kid catches passes for Arizona. All of which is to say that I’m bummed the Dawgs are struggling because I’d like to see HecEd (and whatever Airlines) on full tilt. The Dawg Pound is revered. Alas, so too is Jack Follman. We’ve worked together on a multitude of AZ-UW pieces, he’s a contributor across the internets; most specifically: Pacific Takes. I had some questions for him to catch us up on all things Washington (five game losing streak), Seattle, and this rivalry. I’m going to Seattle. What must I do to capture the entire University of Washington basketball experience? This week we’re going to hear all about strength of schedule, quality wins, and conversations about who beat whom and by how much. Many conversations about resumes, upset scenarios (and I know all of them), and the human element. Debate. Baylor has hired a PR firm to help bolster the conversation surrounding them. All of which will lead to a Selection Sunday – and we love those. So while college football is headed to its first playoff, a tournament, for which no one can explicitly prepare, college basketball teams have been playing tournaments all over the world and in front of no one. From Maui to New York to the Bahamas, preseason tourneys (otherwise known as non-exempt events) have filled our November-into-December plates. They are crowded events preparing teams for the sport’s biggest stage. On this past Sunday night, Washington won the Wooden Legacy tournament! …and so on. Now winning this tournament most certainly does not guarantee an NCAA invitation. But it seems there is a precedence. Further, and of obvious importance, Washington has been playing improved basketball to win themselves a tournament crown. 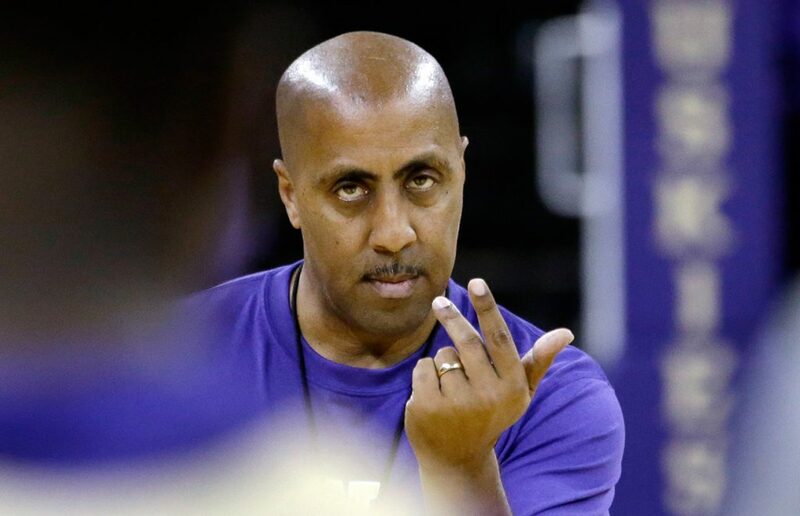 A season ago was the worst defensive team Lorenzo Romar has put on a basketball court. By a long shot (or rather by a lot of shots that went in). Thus far, and I know we’re early, but the Huskies are yielding just 94.5 points per 100 possessions which is 10 points fewer than last season. That ranks a relatively pedestrian 62nd in the country, but it’s 10 points per 100 possessions fewer than last season (worth noting: a 94.5 DRtg would’ve ranked 14th last season). All we can ask is that they improve. Through six games, they’ve won a tournament and they’ve improved! 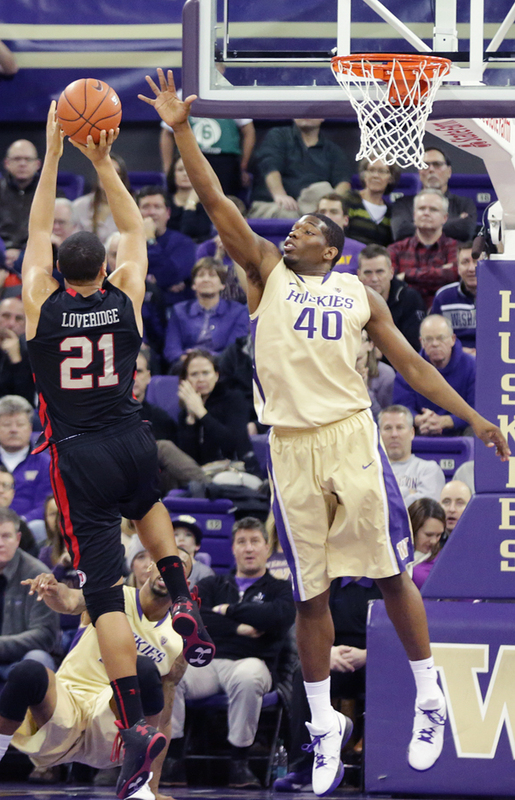 The Huskies rank 15th in the country in defensive eFG% (39.4%). The Dawgs are defending! Individually, I’d like to highlight Shawn Kemp Jr. Last year he was committing 7.2 fouls per forty minutes. That’s comically bad. It’s fouling out nearly two-and-a-half times per contest. This season, however, he’s dropped that number to 3.5 fouls per forty minutes. Consequently he has nearly doubled his minutes played per game and has led the Huskies in scoring three times. He’s averaging 10.3 points and 4.3 boards each night. Needless to say, these are career highs. If we thought the Huskies were missing a low post presence it seems they needn’t look far. They maybe just needed a way to keep him on the floor. Adding further depth to the front court is big man – and former question mark – Robert Upshaw. He’s working his way into the lineup but when in there, he’s wildly effective. His usage is at 23%, he’s blocking shots at the highest rate in the nation, and he’s absorbing missed shots like Kemp used to absorb illegal contact. I presume he’s working into improved playing shape as he’s seeing minimal court time (just 16.5 mpg) but his high usage and maximal efficiency (119 ORtg) suggest that his presence will soon be more regular. I could probably go on but so too must the season. We’re early in this thing and we’ve got a Selection Sunday to prepare for. Furthermore, you don’t need me to regurgitate statistics. Just tune into a UW game and you can see for yourself – they look like a much improved team. Nigel Williams-Goss can create; Jernard Jarreau is a healthy weapon; Andrew Andrews has the same name twice; and Donaven Dorsey is in a nice situation by which to develop and contribute. So let’s be clear: There’s reason for optimism in Seattle and not just because of recruiting. These Dawgs are tournament champions. Between Roberto Nelson and CJ Wilcox, these tremendous seniors have weathered the worst Pac-12 storm we’ve ever seen. And that’s on a coast that rarely experiences bad storms. Across their four years, they’ve been a part of some awful conference play. Yet here they are now, on the cusp of being two of the best players in a conference possibly sending 7 teams into the Dance. And do you realize that neither of these two would make a normal first team all-conference team? Normal would suggest a five-man squad which the Pac-12 doesn’t do so they’ve got a Pac-12 chance at first team. But these guys aren’t even top-5! Sure, neither plays on a particularly dangerous squad so they fly under the radar, ignored pretty regularly despite terrific individual numbers. I get that wins are the most important stat; but that doesn’t mean we can’t appreciate an individual’s efforts to try to win. I wanted to tell each of their stories, how they affect the game. But as I worked harder into their numbers, deeper into their stories, I found some interesting parallels. And some fascinating divergence. I was really excited to see these near identical outputs. The two best players on these two average teams. I mean, even their teams are nearly identical. Washington is 16-13, 8-8 and Oregon State is 15-13, 7-9. I even took a gander at their win shares: Nelson 3.7, Wilcox 4.0. Right on down the line they seem to be pretty similar. Wilcox is 6’5″ 195lbs. Nelson is 6’4″ 198lbs. Same size, same numbers, the big picture suggests they affect the game similarly. But going a level deeper, we find our divergence. Simply put, Roberto gets to the rim and CJ prefers not to. If you were paying attention to the chart above, you’d have noticed they were making nearly the identical number of FGs per game (6.2 Wilcox, 6.1 Nelson). Yet, per our graph above, Nelson is taking 18.5% more two-point shots than Wilcox. How are they putting up the same number of points. If you guessed free throws, you were right. Nelson’s free throw rate is double that of Wilcox’s (56.7% vs 26.3%). And so it makes sense. Like our Delon Wright study, Nelson is the slashing creating type. He differs from Wright in that he connects on 40% of his threes (Wright’s an atrocious 25.6%). But ultimately the two of them, as noted, are slashing and creating. Nelson’s possessions result in a play at the rim more than 40% of the time. It’s inside the paint that Nelson fights to 20.6ppg with just a sparse percentage of his shots being assisted. A little more than a third of Nelson’s shots at the rim are assisted. With Wright as our barometer, Nelson gets a slight more help from his friends. Wright has 29.4% of his rim shots assisted. 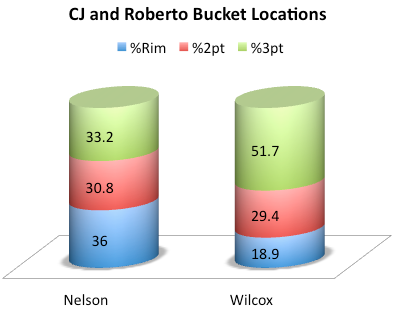 For continuity’s sake, Wilcox is assisted on 45.3% of his rim buckets. These numbers suggest some self-reliance on the part of Nelson and Wright, the ability to create for oneself. Not CJ’s strong suit. Wilcox is a phenomenal three point shooter. We noted he makes 40% of his shots from there and takes half his shots from there. That’s a productive output and why he’s 10th in the conference in eFG%. Conversely, Nelson leads the conference in usage (32% good for 21st most in the nation). Nelson needs the ball in his hands to affect the game. Now obviously so too does CJ, but he ranks just 19th in the conference in usage, the lowest such percentage amongst the conference’s top-10 leading scorers (Wilcox is fifth). He’s a beautifully pure shooter. I’m inclined to note how often CJ’s threes are assisted but it’s actually below the D-1 average (75.3% vs 84.9%). Not exactly fulfilling our CJ-is-team-reliant narritive. But as such a great shooter (career 39.2% shooter as compared to JJ Redick’s 40.2% or Salim Stoudamire’s 45.8% – wait, Salim was that much better than JJ, sigh…) it’s understandable that Wilcox is going to get the green light a little more often than not. Particularly as a senior with two underclassmen guards feeding him. Year-over-year, Wilcox’s percentage of assisted threes has decreased (I see you Abdul). Ultimately, what each of these players is accomplishing is individually impressive and unique. They’ve arrived at similar destinations taking very different paths. Neither of these seniors will win the Player of the Year award. But each has been a terrific Pac-12 basketball player, contributing to the resurgence of a conference once mired below mediocrity. It was the laughing stock of college basketball. Today, while neither of their teams has seen great success, they’ve developed into two of the most dynamic and unique players in the conference. A part of arguably the best guard corps in the nation. And they are seniors at the ends of their respective paths. I enjoyed watching them and I imagine you did, too. They did great. Good luck. For whatever reason I’m compelled to open by citing that the Abdul Gaddy era in Washington has officially come to a close with…the emergence of a promising local, five-star point guard expected to be a game changer. Anyhow, the parallels are always funny but that’s the beautiful promise of change. And change the Huskies have, going all high-post offense and sh** while missing on Mike Moser and Aaron Gordon. But that’s neither here nor there. It’s Nigel-time. The guy’s name ends with three consonants. Three consecutive consonants is a sound. If a seven footer with an onomatopoetic closing to his last name doesn’t dispel some of the Huskies’ post issues, then I don’t know what will. If you listen to Romar, however, he feels it’s going to be Perris Blackwell – a USF transfer weighing in at 275lbs – who’s going to give the Dawgs a post presence they haven’t “had in years.” Romar told us he could threaten for leading scorer which is saying something considering the reason I really do love the Huskies is their guard play. CJ Wilcox can flat stroke it and carried this team for much of last season. He lead the team in both percentage of shots taken AND ORtg. Gotta like that combination. If nothing else, the thick bodies of Perris and Shawn Kemp Jr can set monster screens for that guy to get open. Additionally, his running mate doesn’t just have two first names, but rather TWO OF THE SAME NAMES! Andrew Andrews, folks. Why I hate them: They’ve lost Aziz and really don’t have anything proven in the post besides a guy better recognized for his name than his game: Shawn Kemp, Jr. They run a high post offense which is to ask a lot of their bigs to be decision makers. Good decisions – like wisdom – generally come with age and familiarity and unfortunately the Husky frontcourt returns players who posted the following in % of minutes: 59.3% (Desmond Simmons), 37% (Kemp), 28.7% (Jernard Jarreau). Now, inexperience is not the kiss of death, but it sure ain’t helping me love the Huskies any more. Blackwell helps, though. In their words: More coming here but the guest post was so damn well done it’s going to get it’s own posting. That is the KenPom AdjT ranking of the 12-13 Huskies – their first in the high post offense. That pace was the lowest a LoRo offense has ever ranked by 146 spots. That’s right, the previous LoRo slow was ranked 57th in the nation at 70. 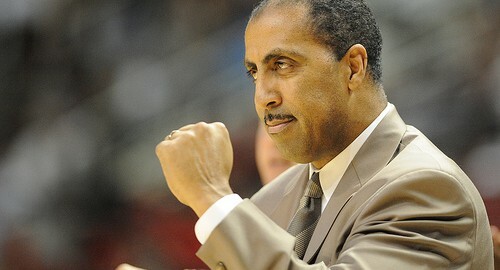 Last year they paced out at 65.7 – nearly the only ever Romar team in the 60s. 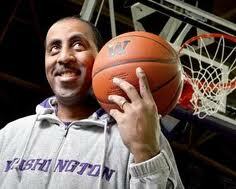 Alas, after finishing 18-16, Romar has vowed to pick things up again. Outlook: These Dawgs are increasingly interesting as I absolutely love senior guards and the Huskies have CJ Wilcox. Their frontcourt pieces are intriguing but not necessarily promising like their backcourt. Nigel Williams-Goss is a pleasant addition and I always love a Lorenzo Romar offense. A season ago he was missing the depth to really get things going. It seems the Dawgs have the opportunity to regain some of that high octaine swagger we all know and love from Seattle. I don’t think Washington fights for a Pac-12 championship or really even much of an NCAA birth. They’re going to spend the season causing problems for people and then giving us a few head scratchers. They’ll pose a threat inside HecEd but I can’t see this group getting mentioned on a Sunday afternoon CBS show. Jack Follman is a writer and editor at PacificTakes. He’s a long time Washington Huskies fan and a native of the state. People love tragedies. We may act like we don’t, but we do, or we at least find tragedy stories engrossing and sports fans are no different. We don’t love, but are fascinated by the stories of people who had it all and either threw it away or lost it tragically. Case in point, Len Bias and Ben Wilson provided two of the most popular documentaries in the 30 for 30 series 25 years after their passing. One of the most common and modern Greek tragedies that exists in the world of college sports right now is the 5-star, future All-American recruit who fails to live up to expectations, but particularly those that flame out in spectacular fashion. It seems that if you aren’t going to live up to expectations that it is, in the words of Neil Young, better to burn out than fade away. But what happens to those that fade away? What is their story? I don’t know if I could think of a better athlete that exemplifies the idea of fading away as opposed to burning out than Abdul Gaddy. I’m sure no one, absolutely no one, needs to hear about Gaddy’s hype coming out of high school by comparing his position ranking when compared to John Wall’s, but as pretty much every Pac-12 basketball fan knows, he was a big time recruit and to sum it up simply, he didn’t really pan out, but he also wasn’t a bust. It’s kind of hard to carve out an identity as a journeyman player in a sport that only gives you four years, but that’s kind of what Gaddy is. He is kind of like a college version of what Kenny Anderson was in the NBA and for as much scrutiny as he has faced from Husky fans for his inability to become just a little bit less good than the aforementioned Wall they all should have an appreciation for him. In the transfer-happy world that college basketball has become, it now seems like every player, especially a 5-star type recruit, who isn’t immediately crowned a star at his respective school is out the door to another almost immediately. I’m sure there were numerous times when Gaddy could have done this and I wouldn’t be surprised if there were times when he really thought about doing this, and who could blame him? For whatever reason, good or bad, he stuck it out in Seattle and when this season likely ends for the Huskies early in the NIT or in one of those god awful tournaments that begins with the letter C, Gaddy’s meaningful basketball career will almost assuredly be over and unlike most players who had careers like his, he will be largely remembered by Husky fans and probably not positively. But I don’t really think that is fair, especially if you think of it this way. Of the six five-star-caliber players ever signed by Washington, I would say that Gaddy has had the third-most overall valuable career for the Huskies – behind Jon Brockman and Quincy Pondexter but ahead of Tony Wroten, Spencer Hawes and Martell Webster who never even ended up playing. Maybe I am just searching for ways to sugar coat Gaddy’s career, but the truth is that because of the NBA, Gaddy actually was fairly decent when compared to the other most hyped players that the Huskies have signed. With all of this said, there is some tragedy in Gaddy’s story and it took place in January of 2011 when he tore his ACL and knocked himself out for the rest of the season. He was arguably performing about as well as he had throughout his entire career and was fitting into the role that fit him best. As a distributing point guard for superb talents like Isaiah Thomas, Terrence Ross and Mathew Bryan-Amaning (Okay, not all superb talents) that could mask his scoring inabilities. The Huskies were rolling and one would have to wonder if having a healthy Gaddy on that team would have pushed the Huskies to a better regular season record and further in the NCAA Tournament in which they were knocked out by North Carolina in a heartbreaker. So there you go, Gaddy’s story does kind of fit into the neat package that we crave so much and assuredly will gorge on in many segments during the tournament in between the same insurance company and AT&T commercials that are shown repeatedly.